Arlington Food Assistance Center, (8 spaces available): Volunteers will assist at the Arlington Food Assistance Center with food organization, storage, and other projects. PROJECT CANCELED due to weather – Arlington Parks and Recreation, (20 spaces available): Volunteers will be helping out at Quincy Park where they will be converting a service lane back to a lawn. Volunteers will also help to add more understory plantings and composted leaf mulch. We provide all the tools, the materials and wheel barrows. Britepaths, formerly Our Daily Bread, (10 spaces available): Britepaths, a non-profit which focuses on supporting low-income working families on the path to self-sufficiency, is moving! So, we are in need of a team of 10 volunteers to come and Inventory our current office in advance of our move in August. We will also provide an overview of our organization and current volunteer opportunities. 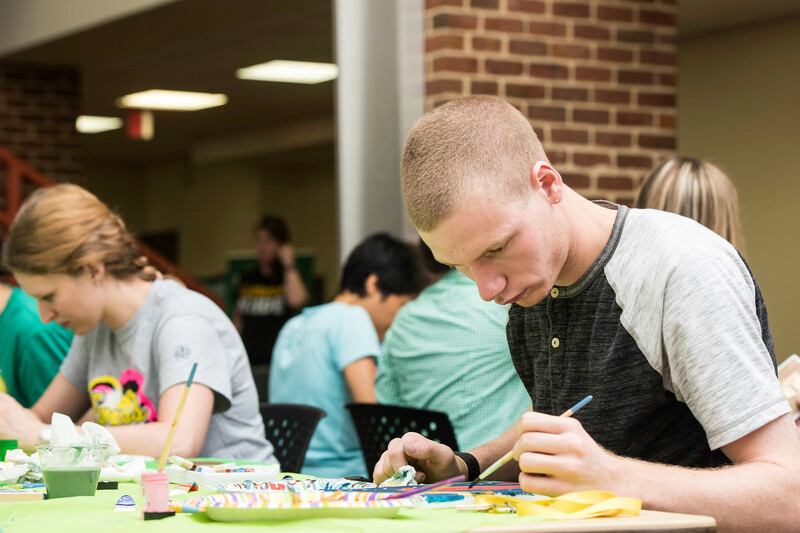 The EDGE Service Project (25 spaces available): The EDGE Excel Series at the Science and Technology Campus is a popular Challenge Course element again in need of care. The Excel Series simulates the adventure of carrying a team member in a rescue litter through a series of challenges that change and increase in difficulty. Local fire and rescue departments include this series of elements as a part of their staff development program. It is an element located in an area that is best maintained with a concentrated effort by a team of “can do” volunteers. Are you a volunteer ready to meet the challenge? Dress in sturdy work clothes. Boots, long pants and work gloves are recommended. Hats, sunglasses, long sleeve shirts are important as well. Don’t forget to bring a water bottle or bottle of water to stay hydrated. Volunteers should meet in front of the Hylton Performing Arts Center. Parking close to the Center is best. Transportation via the Mason Shuttle is also an option. Fairfax Humane Society – Farm Location (25 spaces available): Volunteers will help with landscaping around the property to include weeding, distributing mulch, clipping bushes and other various yard clean-up activities. They will also need help with bathing some of the dogs during our time there. Fairfax Humane Society – Headquarters (8 spaces available): Volunteers will help with office organization and working on projects for the animals. Fairfax Humane Society – Thrift Shop (5 spaces available): Volunteers will help in the Thrift Shop with organization and other projects. United Community Ministries (10-15 vavailable): Volunteers will assist teachers and staff in the classroom, creating a warm, friendly, and child-centered environment. Activities include reading to the children, circle time, play time, singing, and dancing. It really is a joy working with our kiddos! 2-4 volunteers per classroom. Women Giving Back (20 spaces available): Volunteers will help with sorting through donations and restocking after the July stores. Diaper Cake Making (10 spaces available): Volunteers will help make diaper cakes. We invite ALL staff to donate diapers of any size, as well as receiving blankets, rattles, small stuffed animals (“luvvies”) and ribbon for diaper cake decoration. We will be creating diaper cakes for new and expecting families with donated items, including smaller size diapers. Diaper cakes are easy and fun to make! All diapers and diaper cakes will be donated to the SERVE Family Shelter in Manassas, Prince William County. Will take place in the Creativity Corner. Project Linus (15 spaces available): Volunteers will be helping to make handmade fleece blankets for Project Linus. Blankets will be distributed to children in need. Animal Blankets and Chew Toys (15 spaces available): Volunteers will be making blankets for animals in shelters and foster care. PROJECT CANCELED due to weather – Potomac Heights Organic Vegetable Garden (20 spaces available): Volunteers will help with the garden. Volunteers are encouraged to bring water, snacks, garden gloves, sun screen, and hat. President’s Park Greenhouse (10 spaces available): Volunteers will help with the greenhouse. Volunteers are encouraged to bring water, snacks, garden gloves, sun screen, and hat. Brother’s Brother Medical Supplies Kits (15 spaces available): Volunteers will focus on breaking down expired surgical packs so that we can save all of the usable materials inside and repack those for shipment to hospitals in the developing world. Responsibilities may change based on how our needs change between now and then.